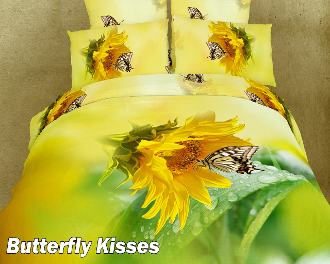 This spectacular butterfly themed bedding will create a fresh spring like look for your bedroom decor all year round. 6/4 Pieces Luxury Duvet Cover Set Bed in a Box with Reversible Design. Set includes: 1 Fitted bed sheet, 1 Duvet Cover, 2 Pillow cases (Twin 1) and 2 Pillow Shams (Twin 1). Machine Washable: Normal w Cool Water Tumble Dry.